Aerosols in workplace atmospheres have been - and continue to be - a major focus of industrial hygiene. Although there are many existing texts on aerosol science and on occupational health respectively, this new book sets out to be complementary to these and to provide a link between the two fields. In particular, the central concept of worker exposure leads to a structured approach which draws together wide-ranging aspects of aerosol science within the occupational health framework. Introductory chapters are concerned with the nature and properties of aerosols, and how they are generated in the occupational environment. 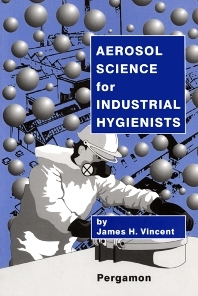 The book then goes on to provide a description of the fundamental mechanical properties of aerosols, in particular those mechanical properties associated with the motion of airborne particles (which govern particle transport, inhalation, deposition, sampling and control). There follows a description of the optical properties of workplace aerosols since these are important in the visual appearance of aerosols and in many aspects of measurement. The central core of the book deals with the processes which govern the nature of exposure to and the subsequent fate and effects of airborne particles, leading to a rational framework for standards, measurement and control. Finally, a chapter is added which relates what has been said about aerosols to gaseous and vapour contaminants. The book is aimed at graduate students and practitioners in industrial hygiene and other occupational (and environmental) health disciplines. Postgraduates, including: industrial and occupational hygienists; occupational health practitioners (including medical officers and researchers, occupational epidemiologists); aerosol scientists (including physicists, mathematicians, chemists biologists); engineers (mechanical, chemical and civil); toxicologists; regulators. Preface. Introduction to Aerosols. What is an aerosol? 'Good' versus 'bad' aerosols. Workplace aerosols and occupational health. Aerosols and gases. The Properties of Air and Gases. Introduction. Basic nature of gases. Elementary fluid mechanics. Properties of Aerosols. Aerosol generation in workplaces. The evolution of aerosols. Particle morphology. Aerosol concentration. Particle size. Elementary particle size statistics. Electrical properties. Mineralogical and chemical properties. Biological properties. The Motion of Airborne Particles. Introduction. Drag force on a particle drag. Particle motion. Similarity in particle motion. Particle aerodynamic diameter. Impactation. Elutriation. Aspiration. Diffusion. The Optical Properties of Aerosols. Introduction. Physical basis. Concept of extinction or transmittance. Particle extinction coefficient. Experimental measurements of extinction. Light scattering. Particle scattering coefficient. Mass concentration aerosol photometry. The visual appearance of aerosols. Optical microscopy. The Inhalation of Aerosols. Introduction. The human respiratory tract. Aerosol inhalation. Experiments to investigate aerosol deposition in the respiratory tract. Extrathoracic deposition. Thoracic deposition. Total respiratory tract deposition. Deposition of fibrous aerosols. Electrostatic respiratory tract deposition. Mathematical modelling of lung deposition. The Fate of Inhaled Particles. Introduction. Biological mechanisms of clearance and re-distribution. Experimental methods. Studies of clearance and build up. Experimental studies of dust accumulation in lung-associated lymph nodes. The significance of overload. Kinetics of clearance. Dosimetry. Standards for Health-Related Aerosol Measurement and Control. Introduction. Progress towards criteria for measurement of coarse aerosols. Progress towards criteria for measurement of finer aerosol fractions. Harmonisation of criteria for aerosol standards. Standards. Aerosol Sampling in Workplaces. Introduction. Sampling by aspiration. Aspiration efficiency of thin-walled sampling probes in moving air. Aspiration efficiency of blunt samplers. Sampling from calm air. Physical factors which can complicate sampler performance. Sampling in stacks and ducts. Sampling for coarse aerosols in workplaces. Sampling for respirable aerosol in workplaces. Practical sampling for thoracic aerosol. Sampling for more than one fraction simultaneously. Aerosol spectrometers. Sampling of bioaerosols. Sampler system components. Quantitation of collected samples. Direct-Reading Monitoring of Workplace Aerosols. Introduction. General characteristics of optical monitoring. Light scattering photometers. Optical particle counters. Electrical particle measurement. Condensation nuclei particle counters (CNC or CPC). Mechanical aerosol mass monitors. Nuclear mass detectors. Overview. Control of Workplace Aerosols. Introduction. Adjustments to industrial processes. Behaviour of aerosols in the workplace atmosphere. Extraction of workplace aerosols by exhaust systems. Transport of aerosols in ventilation ducts. Particle removal systems. Gravitational separation. Inertion separation. Cyclone separation. Wet scrubbers. Filtration. Electrostatic precipitation. Comparison between air cleaning systems. Containment of aerosols. Personal respiratory protection. Aerosols and Vapours. Introduction. The transport of gases. Inhalation of gases. The sampling of gases. Direct-reading instruments for gases. Air cleaning for the control of gases. Industrial hygiene importance of aerosols and vapours. Postscript. Index.